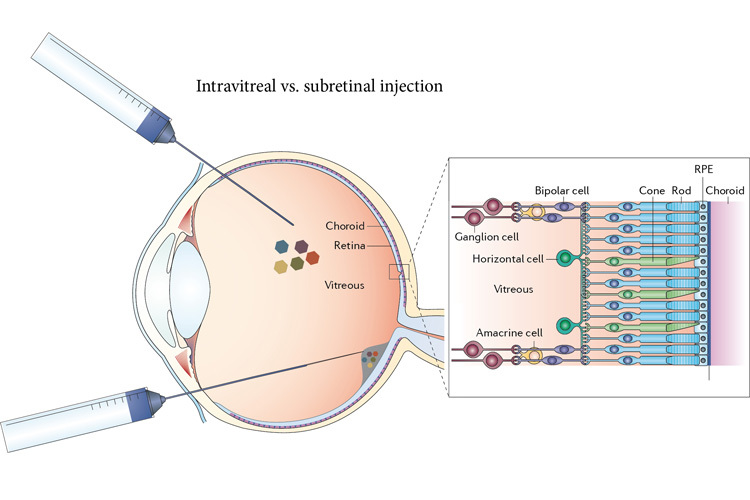 The researchers say that, within as little as three years, the gene therapy — delivered via an inactivated virus — could be tried in humans who’ve lost sight because of retinal degeneration, ideally giving them enough vision to move around and potentially restoring their ability to read or watch video. 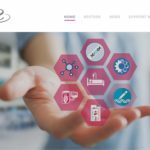 Currently, options for such patients are limited to an electronic eye implant hooked to a video camera that sits on a pair of glasses — an awkward, invasive and expensive setup that produces an image on the retina that is equivalent, currently, to a few hundred pixels. Normal, sharp vision involves millions of pixels. Correcting the genetic defect responsible for retinal degeneration is not straightforward, either, because there are more than 250 different genetic mutations responsible for retinitis pigmentosa alone. About 90 percent of these kill the retina’s photoreceptor cells — the rods, sensitive to dim light, and the cones, for daylight color perception. But retinal degeneration typically spares other layers of retinal cells, including the bipolar and the retinal ganglion cells, which can remain healthy, though insensitive to light, for decades after people become totally blind. Isacoff, Flannery and their UC Berkeley colleagues will report their success in an article appearing online March 15 in Nature Communications. According to Flannery and Isacoff, most people in the vision field would question whether opsins could work outside their specialized rod and cone photoreceptor cells. The surface of a photoreceptor is decorated with opsins — rhodopsin in rods and red, green and blue opsins in cones — that are embedded in a complicated molecular machine. A molecular relay — the G-protein coupled receptor signaling cascade — amplifies the signal so effectively that we are able to detect single photons of light. An enzyme system recharges the opsin once it has detected the photon and becomes “bleached.” Feedback regulation adapts the system to very different background brightnesses. And a specialized ion channel generates a potent voltage signal. Without transplanting this entire system, it was reasonable to suspect that the opsin would not work. 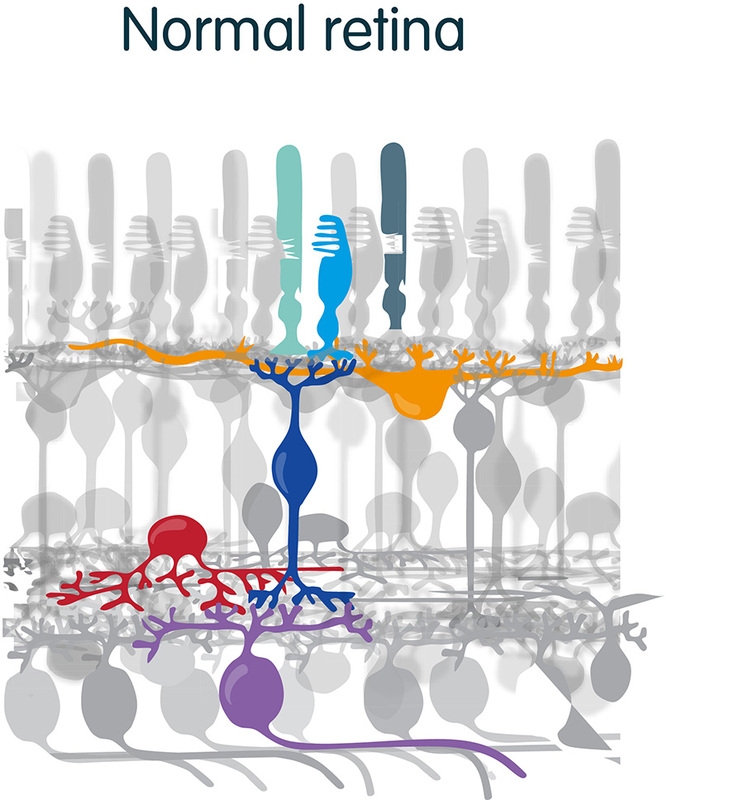 In a normal retina, photoreceptors – rods (blue) and cones (green) – detect the light and relay signals to other layers of the eye, ending in the ganglion cells (purple), which talk directly to the vision center of the brain. To their delight, when rhodopsin was introduced into the ganglion cells of mice whose rods and cones had completely degenerated, and who were consequently blind, the animals regained the ability to tell dark from light – even faint room light. But rhodopsin turned out to be too slow and failed in image and object recognition. They then asked the question, “What would happen if a person with restored vision went outdoors into brighter light? Would they be blinded by the light?” Here, another striking feature of the system emerged, Isacoff said: The green cone opsin signaling pathway adapts. 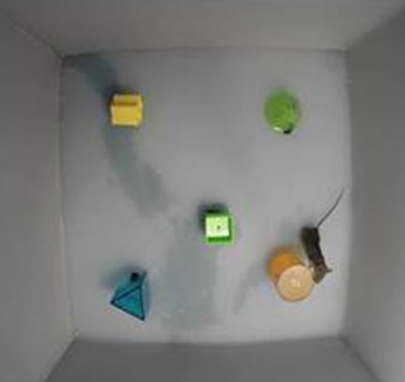 Animals that were previously blind adjusted to the brightness change and could perform the task just as well as sighted animals. This adaptation worked over a range of about a thousandfold — the difference, essentially, between average indoor and outdoor lighting. “When everyone says it will never work and that you’re crazy, usually that means you are onto something,” Flannery said. Indeed, that something amounts to the first successful restoration of patterned vision using an LCD computer screen, the first to adapt to changes in ambient light and the first to restore natural object vision. The work was supported by the National Eye Institute of the National Institutes of Health, the Nanomedicine Development Center for the Optical Control of Biological Function, the Foundation for Fighting Blindness, the Hope for Vision Foundation and the Lowy Medical Research Institute.